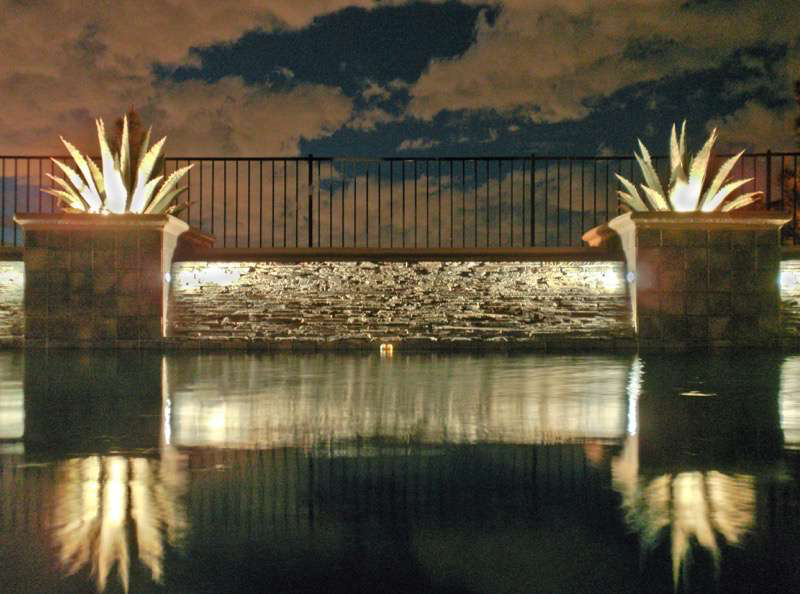 Most of the landscape lighting projects that Las Vegas Landscape Designer, Twilight Designs installs, are done on properties with established landscaping. In the Las Vegas landscape design phase or other stages of new construction, landscape lighting doesn’t have to be an afterthought or simply left to the landscaping company. There are many advantages to working with a landscape lighting professional during the landscape design phase. 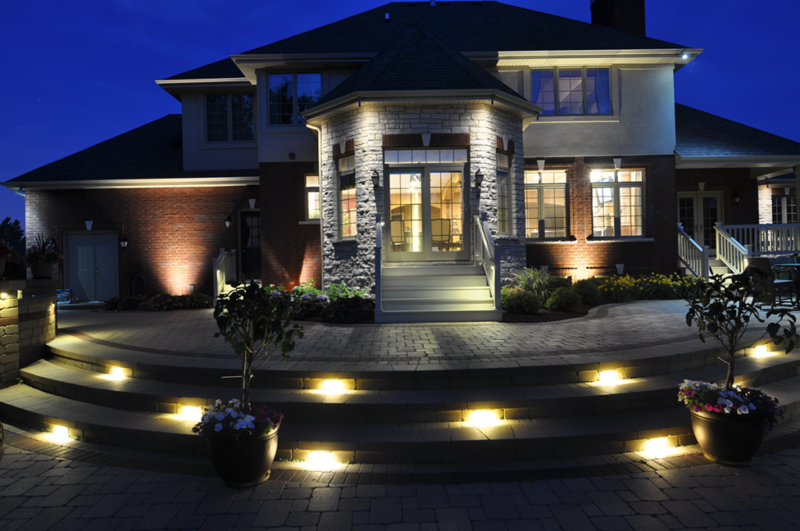 Planning ahead often times is an opportunity to avoid many of the challenges that come with installing a lighting system on a home with established landscaping. 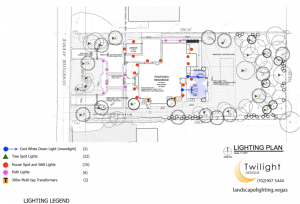 Here we’ll guide you through what to expect when working with Twilight Designs during the planning and construction phase of your home and landscaping. There is not much work that can be done at this stage but there are a number of reasons that this is a great time to start thinking about your outdoor lighting system. 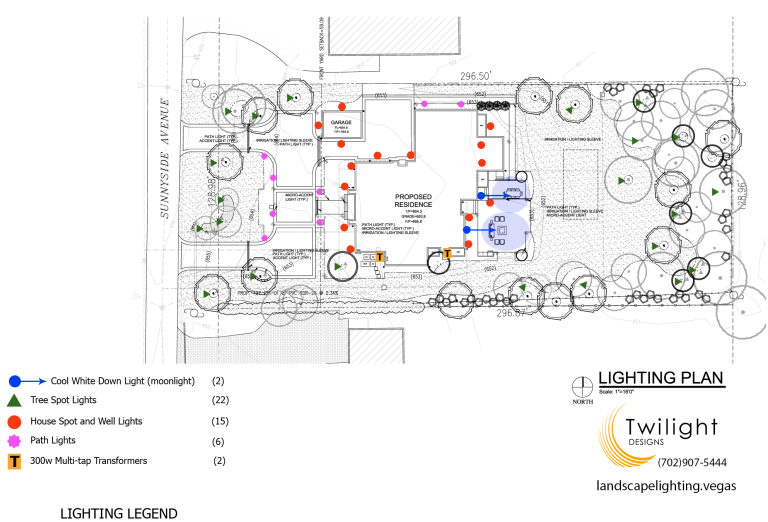 Although our focus here at Twilight Designs is landscape lighting, we are lighting designers. Many homes in Las Vegas incorporate can lighting in the eaves of their homes. 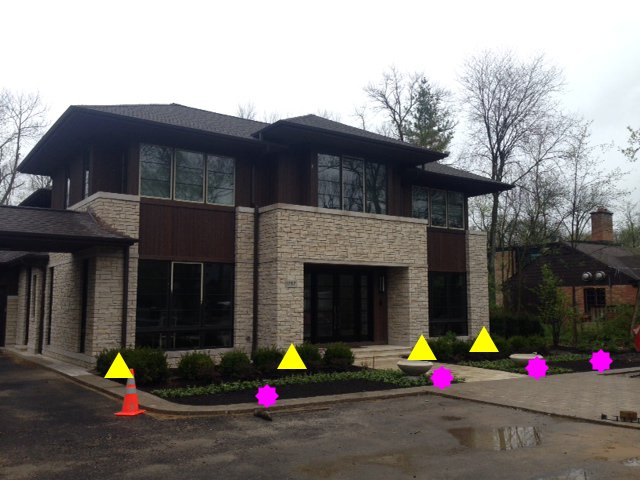 All too often the electrical plan specifies can lights at equal spacing around the perimeter of the roofline. This often places fixtures over large windows, conflicts with areas that would be best lit from the ground, or fails to accentuate key architectural features. Most builders and electricians are happy to incorporate our ideas and suggestions into your home’s electrical plan. Most of our projects include some type of peak lighting, moon lighting, or other techniques that start at your roofline. This requires us to install a wire which typically runs up the side of your home. We always look for a cosmetically acceptable place to run our wires. We follow gutters, solar pool heating plumbing, satellite dish wiring and other existing pathways to conceal our wiring. Occasionally we’ll even run a wire up an inside corner and patch stucco to make our wiring invisible. All this can be avoided during your home’s construction. Countless hours can be saved with a little extra planning during your home’s construction. Concrete is often poured before you even have a landscape plan. From driveways, sidewalks, porches, patios and even sunrooms are all completed before your landscaping. 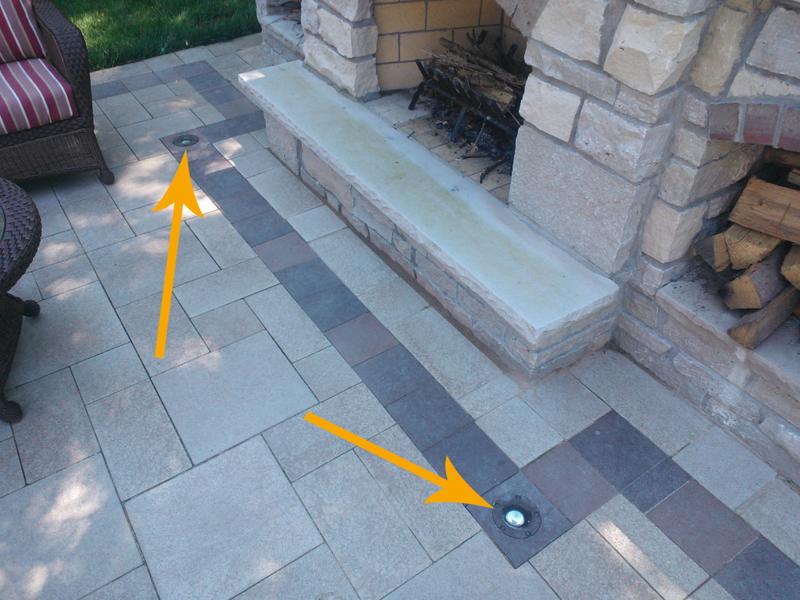 These areas can often become obstacles in your landscape lighting design. We sometimes trench wiring under concrete forms and patios, after the concrete has cured we can core drill a hole for a well light giving us direct access to the wire that was placed below. From crossing a wide driveway to core drilling a well light into the middle of it running sleeves or pre-wiring certain areas can make your outdoor lighting installation a breeze. Lighting within a pool is something that must be carefully planned with the construction of your new pool. Ideally, when you look at your pool from inside your home and the predominant gathering points around your pool you should not see the light source illuminating the water. Most pool contractors do a good job of placing underwater fixtures to illuminate your pool. Just as important though are the areas around your pool. This includes waterfalls, slides, stairs, rock features and more. These areas typically cannot be lit in an optimal way by means of the underwater fixtures alone. Many of these features require above grade fixtures for the best effect and planning ahead can maximize the possibilities to best showcase your pool. In areas where step lighting is the ideal option for lighting a staircase, it is often essential that some wiring be installed before concrete is poured. This is especially true for step lights which are recessed into the face of the stairs. For this type of fixture an electrical box is attached to the concrete forms and the cement is poured around the box. Once the concrete has cured and the forms are removed the socket and reflector assembly can be installed and the faceplate can be attached. This type of step light is most common with extra wide staircases and irregular shaped or curved stairs. All of the above-mentioned scenarios often come before your Las Vegas landscaping design is even finalized. When given the opportunity to work with whichever Las Vegas landscaper you’ve chosen, you will be able to take a number steps to maximize the potential of your lighting system. We will be able to more easily trench and bury all wiring without disrupting pants and ground cover. Sleeves can be is installed to accommodate the LED fixtures specified in addition to areas that may require lighting in the future that would be inaccessible. Wire paths can be designed to follow irrigation lines and other underground “utilities” for a more organized layout decreasing the chances of needing future repairs. 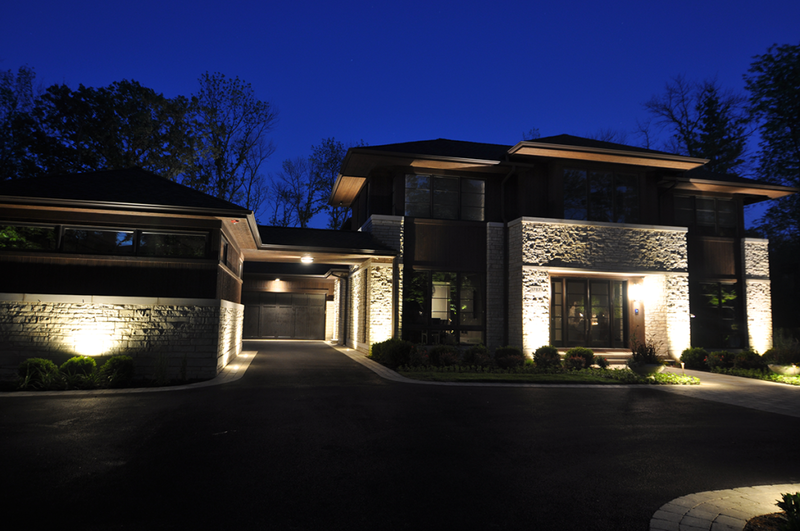 Twilight Designs can expertly install your outdoor lighting system in any phase of your home’s construction. However, If you are fortunate enough to be considering a professionally designed lighting system while you are in discussion with your landscape architect we can design a LED landscape lighting system alongside your landscaping design. Twilight Designs will work seamlessly with your landscaper ensuring that we are available every step of the way so that your landscaper can stay on schedule. These preparations will ensure that your new LED landscape lighting system can be meticulously installed and completed in conjunction with your landscaping.